Pictured Left to Right: Marcia Bryant, Vice President of Clinical Operations; Rebecca Eilert, Assistant Nurse Manager, Emergency Department; Smith; Tony Buzzacco, Director, Emergency Department. 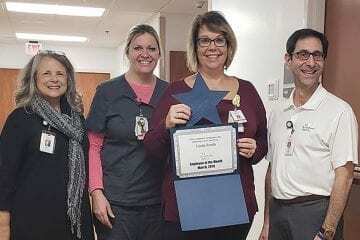 Linda Smith, Staff Nurse (RN) II in the Emergency Department, is The Outer Banks Hospital’s March Employee of the Month. After relocating from New Jersey, Smith joined TOBH in June of 2016. She is an excellent ED nurse and has proven herself a valuable team member, especially when critical situations arise. In the last year, Smith has become a PALS instructor and an EPIC Super-User for The Outer Banks Hospital. She faithfully practices safety by resourcing references when needed and asking providers for clarifications. Additionally, Smith makes herself available to assist Urgent Care staffing in their time of need and beautifully demonstrates accountability, commitment, and ownership in everything she does.